MaryFran Simply...: Helllllooo Out There! Helllooo Out There! Playing along with Altenew's March Inspiration Challenge and this is the first of three cards I'll be sharing today. This one was fun to create I must say. I used watercolor card stock for both the card base and the panel because I needed something to bring it together and didn't have any of the right colored card bases so I painted the blue Altenew dye ink on the base and that seemed to work well for me. I started by stamping the panel with the halftone circles in various sizes in blue and then stamped the butterfly to make it appear as if he was perching on the largest circle. 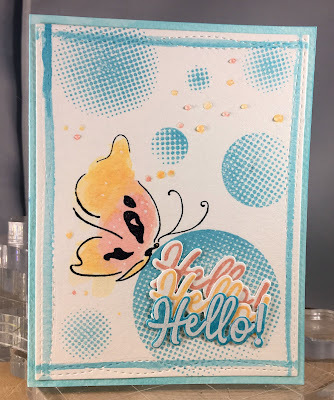 I stamped the 'Hello' and die cut it in the three colors required in this month's challenge. I die cut the panel itself with a stitched rectangle, but it looked kinda blah, so I painted a little watercolor border with the blue Altenew ink and finished it off by splattering the two other colors. I use the clear Nuvo drops over the ink splatters because it makes them appear to be colored drop. I like those drops because they take on the color of whatever is underneath them. Thanks very much for reading this and the materials used are listed below. We adore this card! Great work! 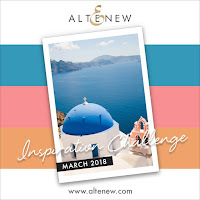 Thanks for playing along with us in the March Inspiration Challenge at Altenew.